Who is this man who claimed to be God? 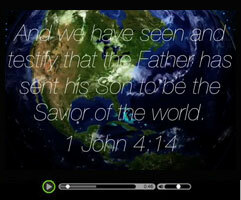 What were the major events in Jesus Christ’s life on Earth? Was Jesus Christ truly the Savior of the world? Study the life of this Man and learn how He can impact your life. As you study, keep in mind what He said while on Earth: "The Son of Man did not come to be served, but to serve, and to give his life as a ransom for many" (Matthew 20:28).